The longstanding international protests against the International Monetary Fund seek to inform people about the levers of power that direct global finance, often, seemingly, to the detriment of poorer nations and the disenfranchised around the world. In Washington, IMF protests expose another problem: the friction that results when the world's most vehemently anti-capitalist movement takes on Georgetown -- which is, shall we say, not anti-capitalist. Yet contrary to early reports, this year's IMF protests appear proper by comparison to protests elsewhere or past protests in D.C.
At about 11:15 p.m. last night, Metropolitan Police Department officers arrested one IMF protester at L and 23rd Streets NW for assaulting a police officer. Reports that several other protesters were arrested for blocking traffic could not be substantiated by police. Last year, a group of World Bank protesters were charged with felony counts of property destruction and rioting, DCist reported. That was a sizable incident for an organized event that has come to be commonplace in Washington any time the IMF, World Bank or World Trade Organization host assemblies here. Reading about the IMF protests that took place in the District back in 2000 feels in many ways unfamiliar to the District of today. 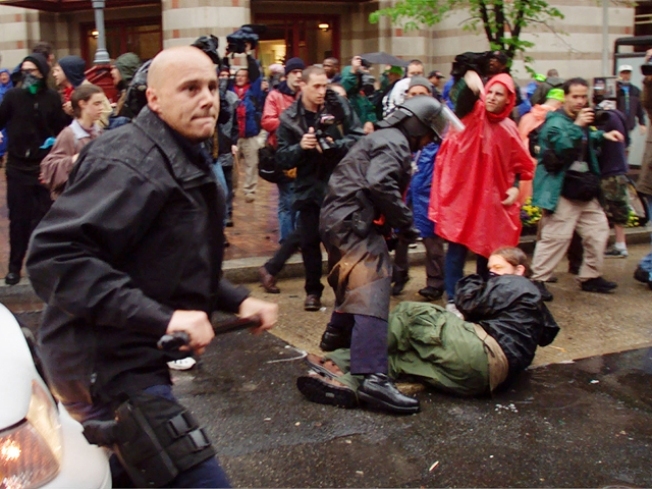 A vision of old D.C. emerges in Mark Ames's writeup for the X of the IMF protests from 10 years ago. Then-MPD Chief Charles Ramsey took a more antagonistic line against protesters than MPD Chief Cathy Lanier seems to. There were at least many more arrests. Ames's writeup makes no mention of the Busboys n' Poets locations around the city that, of course, did not exist at the time. But there is nothing from that era that served as the same public, visible hub for contrary thought. (It might disgust Ames, but they're homes away from home for protest types.) The racial tension between police and protesters also reads like an artifact from a very different area, when the largely white protesters would represent something of a swell of the white population of the District. Naturally, the dress and iconography hasn't changed. Ames's pictures could have been snapped this weekend, though the pants have possibly gotten tighter. His view of broadcast journalists is, regrettably, still accurate: "neatly pressed LL Bean khakis and expensive Rockport-style shoes, had these Ralph Lauren or Northface windbreakers, and hair that looked like it had been stolen from a Macy’s mannequin." Further, the criticism levied against the protesters back then is on that still persists today: largely, that professional protesting is the province of the privileged. As Ames phrases it, perhaps more sympathetically but no less critically: "The thousands who gathered in Washington weren’t protesting so much the devastation in Russia or Ghana or Argentina, although on the surface they meant to. Rather, they were protesting the spiritual devastation that awaited them, a doomed battle against the cubicle plantations that were bound to swallow them up whole." A single arrest could represent any number of things: a more disciplined protest movement or, alternatively, more disciplined police; a new disinterest in the more confrontational tactics favored by protesters of yore; or even police inattention. But it might also be the case that the city is more accommodating to youthful protest organizations like the anti-IMFers. Public transportation and infrastructure are greatly enhanced, and more young people living in Northwest neighborhoods like Columbia Heights means more places for protesters to crash when they visit town. The largest factor behind what appear to be gentler relations between protesters and police may just be growth: The police force is larger, more diverse (including more women and more cadets), more sophisticated, and better equipped to deal with rowdy protesters. A better police force is less easily provoked.